It's a fallacy to think that guitars always improve with age. I had an Epiphone Texan acoustic for forty years and, in spite of a renovation by a local luthier, it had lost its brightness and sounded dull. One day, while browsing the stock in the original "Guitar Junction" shop in Worthing, I spotted this electro-acoustic Martin. As soon as I tried it, I fell in love with it. It rings clearly and plays nicely. The back and sides are HPL - High Pressure Laminate - about which purists might wax sarcastic. To hell with them. I used to play it amplified in the ceilidh band but, more importantly, it's my main recording guitar. The combination of of HPL construction, spruce face and solid birch veneer neck make it incredibly stable sonically, with no flat spots or exaggerated highlights. Perfect for clean acoustic recording. 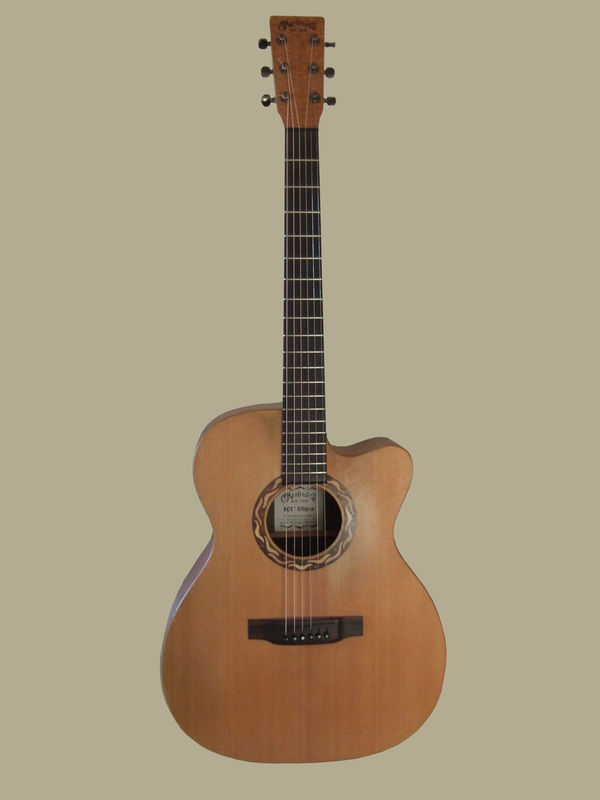 The model was called an "Ellipse" because it was originally fitted with a dual Fishman Ellipse mic & piezo. I threw these out after a while and fitted it with a Baggs iBeam. Strung with Elixir Phosphor Bronze Nanoweb .012-.053 strings.